Laser skin treatments are a popular technique to help people achieve their cosmetic goals. As we age, many of us are continually seeking new anti aging techniques. Thankfully, we do have a variety of options to help reduce the effects of aging on the skin caused by the normal aging process and many other factors. No longer do we have to accept facial wrinkles, scars, and years of sun damage as permanent. One such anti aging option is a laser treatment, sometimes referred to as laser resurfacing, or a laser peel. Laser resurfacing is very effective when used in combination with traditional cosmetic surgeries to improve specific areas of the face that may not be improved by surgery alone or it can be very successful as a “stand alone” treatment to help rejuvenate your appearance. The action of pulsating beams of light removes damaged skin and stimulates new collagen protein and elastin fibers. Lasers can be used for specific parts of the face such as forehead wrinkles, wrinkles around the eyes, mouth or neck, freckles, hyperpigmentation, or a full face treatment that can help lift and firm. The extreme precision of today’ highly advanced lasers gives the technician excellent control to polish a technique. Many anti aging benefits can be achieved with a facial laser treatment. Treatments will address common conditions due to the aging process by eliminating dry, rough textured layers of skin, stimulating cells to improve skin’ elasticity and firming the underlying layers for better support. This is one of the more popular non-surgical facial beautification procedures designed to diminish the appearance of imperfections on the skin’s outer surface bringing about smoother, improved texture. There are several variations of lasers designed to do a job. 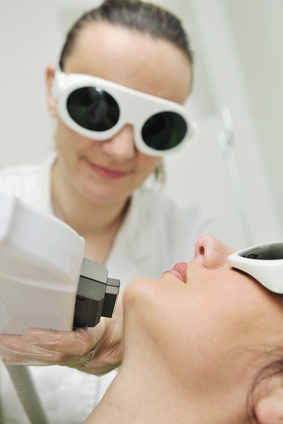 A laser sends pulsating beams of light to vaporize and damage a targeted area of skin. It can treat an area very precisely and it is also able to treat the deeper layers of tissue with heat to encourage collagen production. The damaged layers are removed to allow healing to begin and form new fresh cells. Lasers vary depending on the type. The type used will depend on your own personal issues. Some treatments are less invasive and can be performed during your lunch hour, requiring little or no downtime. Expect some down-time healing with more invasive procedures. The length of recovery will depend on the depth of the injury and how aggressive the procedure. Pinkness of the skin will usually last 1-6 months. To protect the newly laser skin, daily application of a "broad-spectrum" sunscreen is necessary. Decide if a laser skin treatment is right for you as an anti-aging solution.